Step 1: Buy, borrow, or grow a pumpkin. Don't be tempted by other fruits or vegetables. Sure, you might want to be clever and use a watermelon or a coconut, but nobody likes a show off. Step 2: Get the sharpest knife you have in the house. I would recommend that you not use any ceremonial knives. The dark lord never likes for you to mix work and play. If you are letting the little one help out, there are a number of kid-friendly carving sets out there. Step 3: Get newspaper and tape it down to the kitchen table (trust me, you will appreciate me later). I would recommend a large tarp, but if you have a tarp, you are either a serial killer or a mad scientist that keeps his inventions covered until he can elaborately unveil them. Either way, you scare me and I am just going to back away now with my hands raised where you can see them. 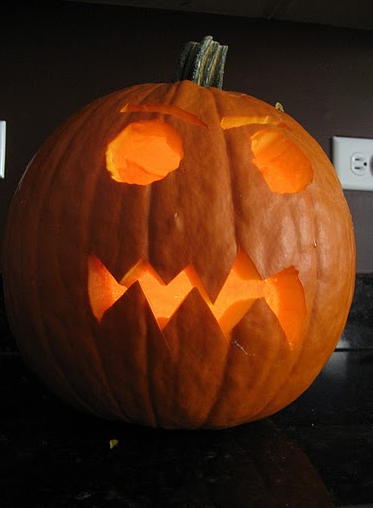 Step 4: Grab the top of the pumpkin and cut an octagon shape that is approximately 3 inches from the stem. And hold the knife at an inward angle to ensure there is a lip upon which the "cap" can rest. Cut a small notch in the side of the cap allowing smoke to get out for when you add the candle. Step 6: Wash out the inside. I recommend using a bit of laundry soap. This will keep the smell of the rotting decorative vegetable to a minimum (for a while). I usually let it sit for about 10 minutes and then dump the water out and wipe the pumpkin dry. Step 7: Take a dry erase marker or a pen and draw out the face that you see in your nightmares (if you can't draw, stick with triangles). Extra points if you just let your kids do it and try not to coach them. If the kid wants three eyes and a square mouth, let him at it. It's Halloween, not an application for Harvard. Step 8: Attack that pumpkin like it owes you money! Sorry, I have been listening to a lot of rap music lately. Actually, I would recommend using very delicate and precise cuts. Pumpkins are not forgiving, and sadly, you can't hit the delete button and start over. Step 8.5: Get a basic votive candle holder and votive candle. Place it inside and ensure that it is stable. I recommend the votive because it leave a cool glow and also, it makes it easy to replace. Step 9: Now take all of the newspaper that is taped to the table (you taped it, didn't you) and ball it up. Proceed to the outside garbage can (do not leave this in your house, because if you do, your house will smell like a fart within hours) and deposit the unworthy parts of your masterpiece. Step 10: Now you can stand back and bask in the glory of your creation. I am sure that you will be the talk of the neighborhood and that the neighbors will come to your door and present you with offerings to ensure that they stay in your good graces. The folks over at Urlesque have a lineup of 31 amazing pumpkins for inspiration. I have to say I am amazed at what people can do with a bit of imagination and a sharp knife. What are you planning on doing this year? Share your works of art with us. As you scoop the “brains” out put the seeds in a separate bowl. Don’t feel the need to get all the gook off of them, they actually roast better with some of it still on. The seeds grow in clumps in there so if they are stuck together, separate them.Preheat oven to 350. Spray cookie sheet with Pam (or similar non-stick spray). Pour seeds onto cookie sheet and distribute so they are 1 layer thick (okay if they are touching). Sprinkle lightly with Celery Salt (not regular salt). Put in oven for about 10 min and then take them out, stir around with large spoon or spatula, lightly sprinkle with Celery Salt again and back in the oven until golden brown, another 5 – 10 min, watch carefully so they don’t over brown or burn..Let them cool before you eat them. The will keep best for a couple days in a bowl with no lid (traps moisture and they seem to get a little soft). No refrigerator either.